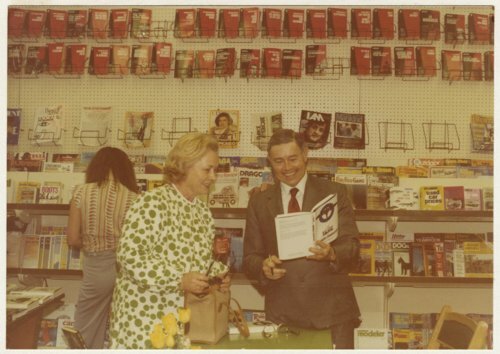 This is a photograph showing Robert S. Raymond at a book signing party. He was the author of A Yank in Bomber Command. While serving for the American Volunteer Ambulance Corps in France, he ended up in England where he joined the Royal Air Force in London in 1940. His adventures were related in a diary and letters sent to his wife Betty Raymond. The diary and letters were woven into a narrative by Michael Moynihan. The photograph appears in So Good, So Far, 1972-1976 by Robert S. Raymond and Elizabeth Raymond.